Internet access, sustainability, and citizen participation: electricity as a prerequisite for democracy? Democracy is not innate but learned, and access to information is the critical link between education and democracy. But access to information is fundamentally uneven, especially for people in the Global South. 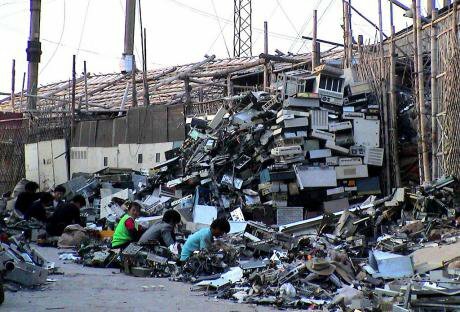 Electronic waste: 100,000 migrant workers labour in China's Guiyu province break down imported computers in hundreds of small operations like this one. Image: baselactionnetwork, CC BY-NC 4.0. Some rights reserved.At its core, sustainability simply refers to the ability to live harmoniously within an environment over time. When applied to modern society, humanity’s long-term survival rests not only on environmental and ecological harmonization, but also on our social and cultural harmonization – the ability to collaborate, communicate effectively, resolve conflict peacefully through legitimate and respected institutions, and participate in our socio-political processes. As openDemocracy’s series on Human Rights and the Internet has aptly demonstrated, sustainability is in many ways a fundamental yet unwritten condition of democracy and public policy. Whether it be the sustainability of cities and the policy considerations needed to both maintain them as well as safeguard them for the future, a more sustainable approach to citizen engagement, the intrinsic link between environmental sustainability and social justice, or the inherent relationship between democracy and sustainability, it is difficult if not impossible to separate the notion of environmental sustainability from its socially focused counterpart: democratic governance. Sustainability is in many ways a fundamental yet unwritten condition of democracy and public policy. A cornerstone of democracy is education, in part, because an informed citizenry is vital to the successful formation and functioning of a government. Democratic citizens are called to exercise their rights and freedoms, such as voting, in the most informed way, participate in civil society, hold elected officials accountable, and call for transparent governance – all of which requires education and training. Since democracy is not innate but learned, it is no secret that access to information is the critical link between education and democracy, and tools like the Internet help facilitate these functions of citizenship. And although digital citizenship, or the ability to participate in society online, promotes social inclusion in particular, many are still excluded from digital citizenship. In fact, access to information via information and communications technologies (ICTs) is fundamentally uneven, especially in the Global South. Even before the launch of the 17 Sustainable Development Goals (SDGs) in 2016, connecting the next billion individuals to the Internet – as well as the billions after that – had become a cornerstone of the internet governance agenda. Given that the United Nations declared that access to the Internet is a human right – and in many ways, a modern necessity for democratic engagement – a key pillar of the UN’s Sustainable Development Agenda includes providing universal, inclusive, and meaningful access to the internet, especially for those individuals who are unconnected. As of late 2016, more than 3.5 billion people were connected to the internet, but this only represents around 49% of the total global population – approximately 4 billion people do not have access to the internet. The vast majority of those individuals who are unconnected reside in developing economies. Yet, in reference to the fourth barrier, challenges to connectivity are not limited solely to the lack of internet infrastructure; it also relates to energy infrastructure limitations as well. For instance, the World Bank’s World Development Report 2016: Digital Dividends found that “more households in developing countries own a mobile phone than have access to electricity or clean water.” In fact, more than 1.1 billion people around the world still have no access to electricity – practically a prerequisite for internet access. The aforementioned World Bank report also found that in Sub-Saharan Africa, only 14% of people have access to grid electricity – even though nearly 70% now have access to mobile phones (though not necessarily an internet connection, especially a high-speed connection). This infers that some people across the Global South own a mobile phone but do not necessarily have access to electricity in their homes to charge it. Lack of internet access is especially problematic because it is a key driver of inequality. The lack of internet access is especially problematic because it is a key driver of inequality, which is a principal threat to not just democracy, but all human rights; hence, the barriers listed above only serve to exacerbate inequality. As the authors of a paper that examined sustainability and participation in the digital commons (Franquesa & Navarro, 2017) emphasized: “it is well established that there is an access gap between citizens who can afford a digital device and an internet connection and those who cannot. Citizens unable to access digital tools are too often confined to the lower or peripheral edge of the society for economic or geographic reasons, such as living in underserved areas without access to digital interaction. As a result of this inaccessibility, such groups are denied full involvement in mainstream economic, political, cultural, and social activities.” Inequality and digital exclusion hurt democracy in general as well as democratization efforts in particular because the access to information along with media & digital literacy as well as ICT skills are vital to prolonged online participation, the use of vital e-government services, and civic engagement. Therefore, regardless of location, connecting another billion people to the internet will require more than an internet-connected device; such an endeavor requires significant long-term vision, investment in both technology and human capacity building, as well as communities committed to ensuring their access is useful, meaningful, sustainable, and democratic. For this to occur, however, such communities must be invested in the process of connectivity – from energy access and network set up and maintenance, to engagement with local officials and building skills – as well as leading this process based on their own needs, context, and developmental challenges. One of the key enablers of sustainable development is the ability to access information, largely through the proliferation of ICTs. Much of the role of ICTs in sustainable development has centered on the concept of information and communications technology for development (ICT4D) in order to catalyze social and economic changes, fulfill the universal right to information, and close the digital divide. For instance, the effective use of ICTs already plays an essential role in helping the world achieve the energy transformation that is necessary to continue to drive progress. While the potential gains from technological progress for workers and consumers in developing countries are large, not everyone stands to benefit automatically, however, women in particular. Only by improving internet access, basic literacy, and updating skill and training systems will the benefits be realized and broadly shared, as well as bridge the gender gap to Internet access, which is why ICT4D has a prominent role within the development community. The literature, however, too often ignores one factor in discussions of ICTs’ importance and employment: electricity. Thus, we cannot legitimately discuss internet access without addressing sustainability. In order to do so, however, a necessary step must be to shift the discourse from ICT4D to ICT for sustainability (ICT4S), which integrates sustainability more prominently to better reflect the aforementioned pillars of sustainable development – especially as it relates to how ICT4D will evolve in terms of priorities and practice in the post-World Summit on the Information Society (WSIS) 10-year review period. Stakeholders from across the internet ecosystem are already progressing this transition by focusing on or incorporating sustainability into their research, advocacy, and policy development processes. These include organizations and initiatives from the private sector (e.g., the Global e-Sustainability Initiative (GeSI)), governments (e.g., International Telecommunications Union (ITU) Study Group 5), the technical community (e.g., ISOC), civil society (e.g., the Association for Progressive Communications (APC)), and academia, including an entire community of researchers and academics dedicated to sustainable ICT research. Clearly, sustainable access is not an entirely new concept per se, but these stakeholders have underpinned and helped frame it within the sustainable development and internet governance agendas. Moreover, by more formally linking ICTs with sustainability, we can more accurately assess how they impact communities and developmental outcomes, help address urgent, global threats such as climate change, as well as whether ICT adoption is sustained over time. And lastly, the ecological impact the digital world is having, such as the impact of e-waste on both the environment and communities, the proliferation of “space junk,” such as defunct satellites or other objects in low-Earth orbit that pose a significant hazard to satellite infrastructure and telecommunications, and the relationship between climate change and the internet/ICTs. Each of these components of sustainable access is meant to address a larger gap in current practices vis-à-vis development and ICTs – i.e., that facilitating access to the internet and expanding connectivity in general must be a seen as a holistic, interconnected process involving multiple stakeholders. This it is vital this process catalyzes a paradigm shift that integrates sustainability into its core, from the manufacturing process of an internet-connected device and building a network, to the skills needed to successfully participate in the information society and how to effectively maintain, repair, and recycle ICTs. The logic behind sustainable access also takes into account the regulatory, legal, and policy requirements needed to enable real-world action on the ground in local communities as well as regionally and globally. Image: Nicolas Nova, CC BY-NC 2.0. Some rights reserved.Although rather axiomatic, universal access to affordable, reliable, and modern energy sources is critical to sustainable development. In fact, “two of the main problems in the realization of sustainable development are a comprehensive energy supply and the consequences related to energy use.” This is not surprising since, energy – electricity in particular – is crucial to improving the standard of living for people in low- and middle-income countries, and modern energy services are central to the economic development of a country and to the welfare of its citizens. The rapid growth of remote digital sensors has the potential to bring unprecedented and, in principle, almost unlimited rises in energy consumed by smart technologies. Yet, since constant, reliable electricity is needed to power telecommunications infrastructure, internet access itself will not be sustainable without a sustainable energy source. Thus, what is notably absent from the current discussions surrounding energy and the internet is how the growth and proliferation of ICTs will affect the amount of energy needed to power them. It is estimated that ICTs account for around 10% of global electricity use, and are responsible for approximately 2-3% of all annual GHG emissions. It is clear, however, that data use and generation is rising exponentially, which has a direct impact on energy. In fact, researchers from Lancaster University in the U.K. warned that the rapid growth of remote digital sensors and devices connected to the internet and the internet of things (IoT) has the potential to bring unprecedented and, in principle, almost unlimited rises in energy consumed by smart technologies. Simply consider that current estimates place the growth of the IoT at a staggering 20.4 billion devices by 2020, which is the conservative figure – some estimates place it much higher. Moreover, according to Lancaster University: “The increase in data use has brought with it an associated rise in energy use, despite improvements in energy efficiencies. Current estimates suggest the internet accounts for 5% of global electricity use but is growing faster, at 7% a year, than total global energy consumption at 3%. Some predictions claim information technologies could account for as much as 20% of total energy use by 2030. Additionally, when considering connecting the next billion internet users, it is equality important to consider the devices they will connect with. How are these devices going to be manufactured and eventually recycled (or will they simply be discarded)? Given that the internet and ICTs are using more and more energy, what kind of energy is going to power the data centers and other critical internet infrastructure feeding our increasingly data-hungry habits? How do we satisfy growing energy demand in general, and mitigate machine-to-machine (M2M), ICT, and data transit energy consumption, which is rising as well, in particular? And what about other related aspects of technology, such as the growing amount of natural resources like purified water needed to manufacture semiconductors, or whether or not the minerals in internet-connected devices are mined from conflict zones – only to be shipped back one day to be dumped in a slum? These are but a few of the myriad questions that are going unanswered, but ultimately, with more data comes more energy consumption and a greater impact on the environment. Simply put, we are reaching a point in our civilizational arc where we can no longer ignore that digital technology has a significant ecological footprint, which is why sustainability must be integrated into the core of our infrastructure and ICT development strategies. Fortunately, solutions to such challenges already exist, often involving green, renewable energy sources, such as wind and solar, and community-led initiatives – such as the New Delhi, India-based Digital Empowerment Foundation’s (DEF) Barefoot College, the Nairobi, Kenya-based BRCK initiative, the Rwanda-based Mesh Power project, Solar Sister, which operates in East Africa, the European Federation of Renewable Energy Cooperatives (REScoop), which also focuses on energy democracy, and a host of others – or increasing innovation and energy efficiency. Essentially, different communities from around the world must adopt technology and/or other solutions, such as policy or regulatory ones, that fit their individual context and needs while being based on the resources they have available. For instance, ARMIX, an IXP based in Yerevan, Armenia, reached out to ISOC seeking ways to help them integrate renewable energy into their operations – since Armenia has ample sunlight throughout the year – and also to promote green energy solutions and reduce their electricity costs and consumption. ISOC eventually donated 18 solar panels that produce more than 4 kilowatts of power to help them with one of their points of presence (PoPs). As a result, ARMIX’s electricity costs have dropped by more than 30%, and they are now much less reliant on non-renewable energy sources. In fact, the panels have been so helpful that ARMIX is now looking for ways to expand the use of solar to their other two PoPs. Their success is also an example of the success that can come from the combination of enabling government policy-making, effective public-private partnerships, and sustainable planning, since the government began incentivizing solar energy adoption and a local solar panel company assisted ARMIX in installing them. Technological interventions are not a panacea for the countless challenges of the 21st century in and of themselves, nor is the internet the magic bullet for democracy. Another key solution is enabling the expansion of community networks. As one of the most significant vehicles for connectivity, community networks are at the forefront of connecting the unconnected and a crucial component of sustainable development. Designed to be community-driven, open, freely accessible, and neutral, community networks provide public access, particularly for rural and remote communities, and are, as the Alliance for Affordable Internet (A4AI) stressed, “An important strategy for governments to consider as part of a policy framework to achieve universal access.” Community networks are particularly important to expanding access by addressing market failures or providing connectivity in unserved or underserved areas. 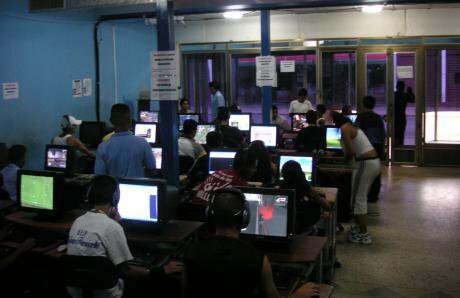 In fact, “The coverage of underserved areas and the fight against the digital divide are the most frequent driving factors for [the] deployment [of community networks].” Community networks do not merely expand access and build infrastructure; they also foster spaces that encourage community and skill building, as well as technical skills needed to maintain the community network’s infrastructure. Such networks undoubtedly empower the unconnected – on their own terms, and based on their unique needs and local context – and are crucial to ensuring the next billion internet users come online in a sustainable way. With more financial, technical, and policy, regulatory support, community networks are well positioned to continue to connect the unconnected while doing so in a sustainable manner, and advocating for sustainable access through on-the-ground practice to address real challenges facing communities around the world. Technological interventions are not a panacea for the countless challenges of the 21st century in and of themselves, nor is the internet the magic bullet for democracy. As we have witnessed all too often, technology, the wrong hands, can easily be harnessed as a tool for authoritarianism instead of democracy. Regardless, however, access to ICTs and information have untold potential to improve lives and catalyze positive sustainable development. Simply put, the internet does not have to be bad for democracy. Franquesa & Navarro (2017) poignantly argued this fact, stressing: “The future of societies around the world depends on accessibility and participation – that citizens must be able to fully engage in the governance of the digital, not only as mere users or consumers. 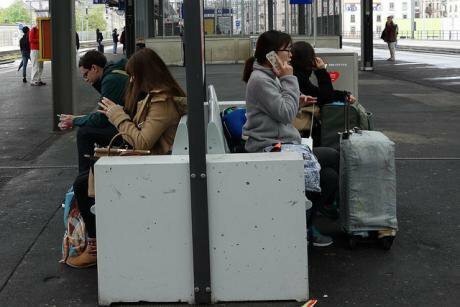 The current model of unequal access to digital devices and connectivity is clearly unfair and unsustainable. Too few participate in the design and governance of the digital world, creating an elite of private interests. A minority of the world’s population can enjoy the benefits of sleek devices and fast connectivity. Everyone is or will be influenced by the growing environmental impact of the digital world. If digitally excluded communities become peer-production actors, they will be able to build their own circular devices and sustainable network infrastructures, they will benefit from local reinvestment of surpluses, and they will have the opportunity to become active participants in the interactions of the design and governance of the common digital space.” Therefore, we should address energy, sustainability, internet access, the right to information, education, civic engagement, and democracy as a holistic and interdependent system. There is so much more that can be done to help people get online and ultimately stay online, across stakeholder groups – especially since the multistakeholder model of internet governance is inherently democratic and inclusive. Yet, ensuring access is sustainable is paramount to ushering in a better, greener, more livable, and ultimately more democratic world.